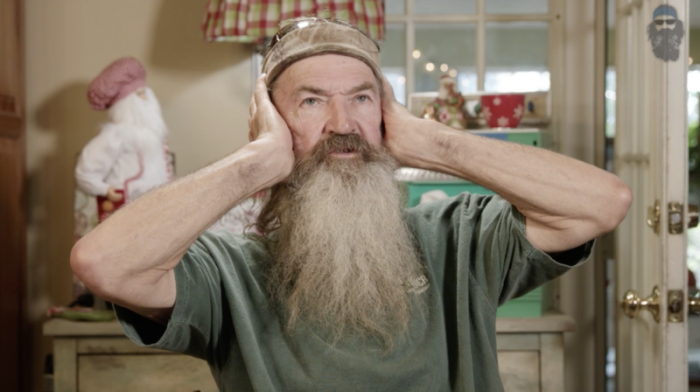 "Duck Commander" Phil Robertson is not happy about all "this Happy Holidays stuff" with people saying "Happy Holidays" rather than calling the season "Christmas," and said it reminds him of some of the Jewish people in biblical times who covered their ears and refused to believe that Jesus was the Messiah. The head "Duck Commander" made known to the world from his former hit reality show, "Duck Dynasty," said the amount of people that do not want to hear the word Christ in Christmas is growing by the numbers. Robertson compared the purge of Christ from a holiday that was supposed to be about Him, to the Jews who covered their ears throughout biblical history refusing to believe that Jesus was the savior of the world. "So how long did they prophesy that Jesus Christ is coming? Oh, about 5,400 years. You can read them all. Where he would be born. What he would be called. God with us," Roberson explained in one of the latest episodes of his new web series, "Into the Woods With Phil," which was posted on Dec 11. "Jesus literally means 'help from Jehovah.' If you would investigate, the Bible says he died on the cross for your sins," he added. A recent Pew Research Center survey found that only 31 percent of adults say they are bothered at least "some" by the declining emphasis on religion in Christmas observations. Robertson also referenced Easter and Good Friday and slammed the fact that all these religious holidays are becoming commercialized. "You can fool around and miss the import of what actually happened," the Louisiana native maintained. The 71-year-old referenced the scripture in Acts 7 which references the stoning of Stephen. "When the members of the Sanhedrin heard this, they were furious and gnashed their teeth at him. But Stephen, full of the Holy Spirit, looked up to heaven and saw the glory of God, and Jesus standing at the right hand of God. 'Look,' he said, 'I see heaven open and the Son of Man standing at the right hand of God. At this they covered their ears and, yelling at the top of their voices, they all rushed at him," the scripture reads. Robertson is not the only one to speak out about the supposed "war on Christmas." President Donald Trump also believes people in America should get back to the tradition of saying "Merry Christmas." While speaking at the National Christmas Tree Lighting and Pageant of Peace ceremony at the White House this month, Trump openly shared the Christmas story with the millions watching and proclaimed that everyone is a "child of God." Robertson, who was very passionate about the subject, also wanted everyone watching to know that Jesus should be celebrated. Along with the family business and his new web series, Robertson serves as an elder at White's Ferry Road Church of Christ in West Monroe, Louisiana. To stream the full episode, titled "Do You Hear What I Hear? (Part 1)," visit "Into the Woods with Phil" HERE.